Another Michigan pheasant hunting season opened Saturday in the Lower Peninsula, and there is good news and bad for hunters this year. There are more birds out there, according to state officials. And Michigan’s pheasant restoration initiative is making progress. But federal funding for the nation’s Conservation Reserve Program is expected to shrink, which, in turn, will affect how much habitat is available for pheasants. CRP is U.S. Department of Agriculture program that helps pheasant, ducks and other species by offering farmers financial incentives to protect wetlands, reduce erosion and create wildlife habitat. Congress has proposed lowering the program cap from 32 million acres to 25 million acres nationally. That reduction, and the consolidation of many federal conservation programs, comes about as members of Congress work to reduce spending and streamline government. The situation has been made bleaker by Congressional inaction that stalled the program; the 2008 federal farm bill that authorizes CRP expired on Sept. 30. The new farm bill has not been approved. It won’t be acted on until after the elections, if then. Politics being what it is,it is anyone’s guess what Congressional priorities will be at that time. But one thing is sure, if Congress doesn’t act by New Year’s, its back to square one with a new set of players in 2013. “CRP is in a state of flux right now” said Al Stewart, the Michigan Department of Natural Resources upland game bird specialist. Michigan farmers have 221,688 acres enrolled in the CRP program which had 29.6 million acres enrolled nationally last year. New enrollees are being turned away, according to Dave Nomsen, vice president for government affairs with Pheasants Forever, the national conservation group. Congress wouldn’t do that, would it? Perhaps it would. Pundits began sounding alarms two years ago, suggesting conservation programs were getting trounced by Congress. But Nomesen said workable bipartisan compromises were reached on the farm bill, which still needs to be voted upon by the House. Despite what is not happening in Washington D.C., Michigan Pheasants Forever members have been hard at work at the local level. Area chapters are partnering with the DNR and private landowners to create pheasant cooperatives in different counties by getting landowners to work together to create large blocks of pheasant habitat. “Things are going well,” Stewart said. Ben Wickerham, the Michigan field representative for Pheasants Forever, said the cooperatives are gaining steam. Neither Wickerham nor Stewart suggests pheasant cooperatives can take the place of CRP lands, but they will help. Wickerham said assistance also is available from other programs such as the Conservation Reserve Enhancement Program and the U.S. Fish and Wildlife Service Partners for Wildlife Program. While Michigan’s Pheasant Restoration Initiative is expected to improve future pheasant populations, Mother Nature is responsible for the modest improvements hunters can expect this year. 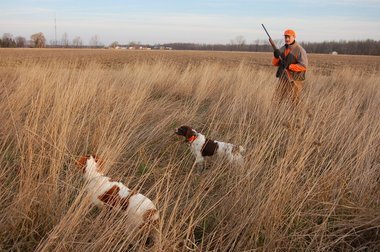 Michigan’s pheasant season opened Saturday in the Lower Peninsula and runs until Nov. 14. It then reopens in the southern part of the state from Dec. 1 to Jan. 1. The season opened Oct. 10 in the Upper Peninsula and closes Oct. 31. This entry was posted in Uncategorized and tagged Conservation, Conservation Reserve Program, DNR, Hunting, Pheasants, Pheasants Forever. Bookmark the permalink.